The Chien-Cheng Circle (Chinese: 建成圓環; pinyin: Jiànchéng Yuánhuán) or Taipei Circle, was once a bustling food market and a city landmark in the Datong District of Taipei. It existed 96 years from its opening during the Japanese colonial era, to its official closing on Sunday, July 2, 2006 after years of decline in resulting from two conflagrations in the 1990s and an unsuccessful project to revitalize the market in 2003. After some replanning, it was set to reopen in June 2009, but as of 2010 the reopening date is uncertain. The original night market was a circular structure located on a roundabout between Nanjing West Road (南京西路) and Chongqing North Road (重慶北路). It covered an area of 1,722 square meters and dated to the Japanese colonial era. It was the most popular night market in northern Taiwan during the Japanese rule. The 1960s and 1970s were the heyday of the night market with booths numbering close to 200 and serving Taiwanese snacks and delicacies such as glutinous rice dumplings, oyster omelettes, fish ball noodles, and unfried spring rolls. Two fires in 1993 and 1999 contributed to the market's decline, and in March 2001 Taipei Mayor Ma Ying-jeou (馬英九) ordered the demolition of Chien-Cheng Circle. He proposed its reconstruction as part of several projects to revitalize Taipei's older districts. At 10 AM on March 29, 2001, the Chien-Cheng Circle was demolished to make way for its new construction located five meters further south of the original site. 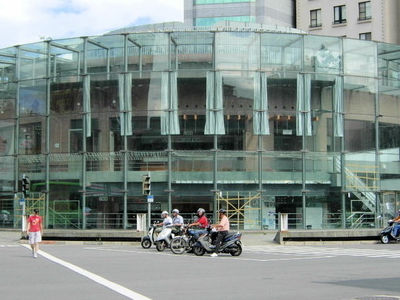 The new two-storey cylindrical glass building was designed by Taiwanese architect Lee Tsu-yuan (李祖原) and cost the Taipei city government NT$160 million in construction fees. An additional NT$50 million in compensation was paid to vendors of the former building. The roundabout was transformed into a crossroad and the surrounding trees were moved to an elementary school in the Xinyi district. During the reconstruction, the engineering team unearthed an old reservoir built by Japanese soldiers during World War II at the center of the circle. The city government decided to make the reservoir the 105th historic spot in Taipei. The new Chien-Cheng Circle was opened in the evening of October 4, 2003, housing 20 food booths and a performing arts center at the top of the building. To promote the opening, the city government gave away 700 food-tasting coupons worth NT$100 each and organized a tour led by Chuang Yung-ming (莊永明), vice-chairman of the municipal research department and professor at the Taipei Medical University. Although the new building was intended to revitalize the market, food vendors had complained that the modern building did not reflect the market's history and lacked a traditional, cultural feeling. They also said that a lack of promotion and assistance from the city government had hurt business. Here's the our members favorite photos of "Landmarks near Datong District". Upload your photo of Chien-Cheng Circle!